As adults, do we still love to hear stories? Do we learn effectively through storytelling? Do we see ourselves as a part of the story, when we read and hear a story? Most of you will agree that the answer to these questions is yes! Storytelling is a very powerful tool to communicate and make an impact. It emotionally connects us and takes us through our own experience. When we are emotionally connected, we learn more effectively. So, it is not surprising that the best trainers and coaches are great storytellers. When trainers tell a story, we tend to connect with it emotionally. Learning is effective and learning outcomes can help us achieve performance goals. 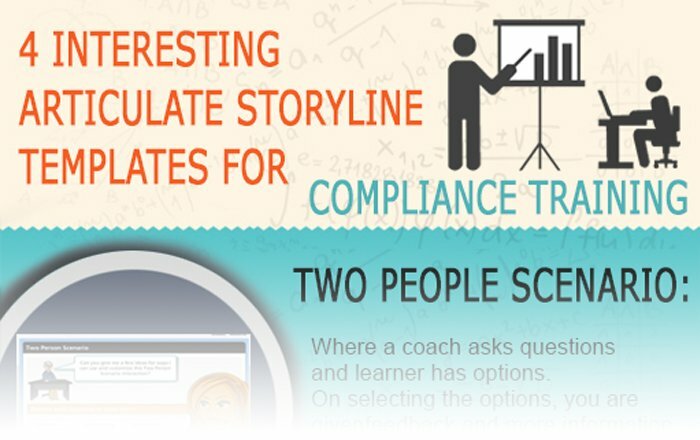 Now, comes the important question – How do we use a story in eLearning? 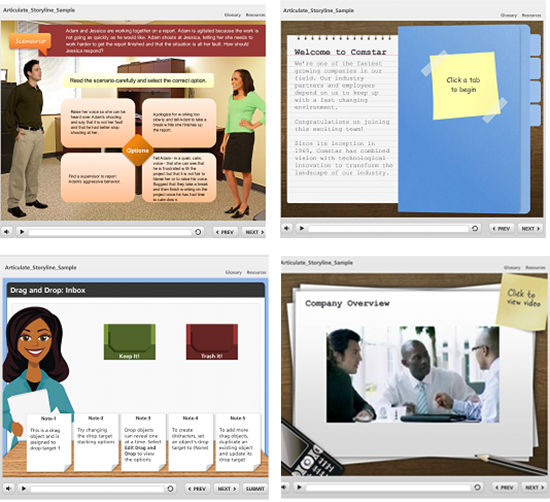 In eLearning, we can make use of scenarios for effectively presenting stories. We can use scenarios in 3 main areas. As you all are aware, people want to learn when they know why they are learning and how the online course will help them solve a problem. They intend to use the knowledge and skills, gained from the eLearning course to enhance their careers. We can start the course with the story of a person, who has to overcome a business challenge and tell the learners that this course will help him solve his problem. In this course on “Information Security for Employees”, storytelling approach is used to set the learning outcomes. In this scenario, information about 3 cases where the company had to pay a huge penalty for breach of data security is presented. This will motivate the learners to understand the importance of data security,and they will be willing to learn about their roles and responsibilities in order to avoid security breaches. We can introduce the characters at the beginning of the course and take the learning through these characters. The whole course can be weaved in the story. This will be very effective, but needs a lot of creativity and time. In a course on “building a workplace culture”,a case study about the employees sharing their experience is presented.. This was used as a learning aid to train employees on the importance of culture on productivity. One of the commonly used and most effective strategies is to use a story to assess the learners. It is an indirect way of testing learners and they have to make the choice in a simulated environment. 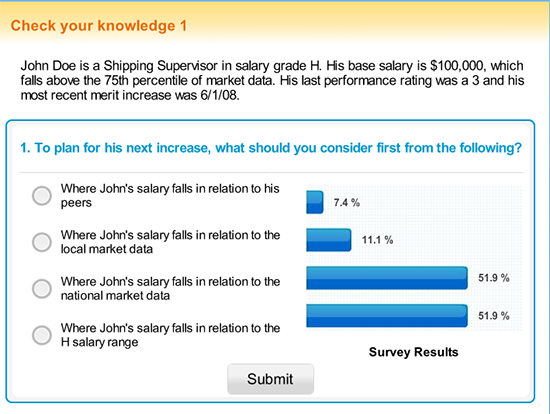 In this course on compensation philosophy,the learner is assessed with a case study. To summarize, we can use the storytelling approach in all aspects of eLearning – setting the stage, imparting knowledge and finally assessing the learner. Now, you don’t need to worry about creating such scenarios all by yourself. Authoring tools like Articulate Storyline have made it easier by giving us some interesting templates to help us get started. Storyline also comes with several characters – both cartoons and real images with various poses that can be used for sharing a story. Thus, using Articulate Storyline,you can harness the power of storytelling to create excellent online courses that capture the imagination of your learners.